DII 100% cotton napkins come in a variety of colors & sizes, giving you numerous options for your next event or dinner party. These napkins are perfect for parties, showers, dinners, everyday use and more. DII Black & White Buffalo Check Napkin is a great gift for Christmas, Holidays, Mother's Day, Dinner Parties, Birthdays as well. These napkins are 100% cotton and measure 20 x 20". To minimize shrinkage, please follow care instructions. To view more of our products visit amazon.com/dii. SET OF 6 - DII Everyday Basic Oversized napkins measure 20x20", 100% Cotton and machine washable. 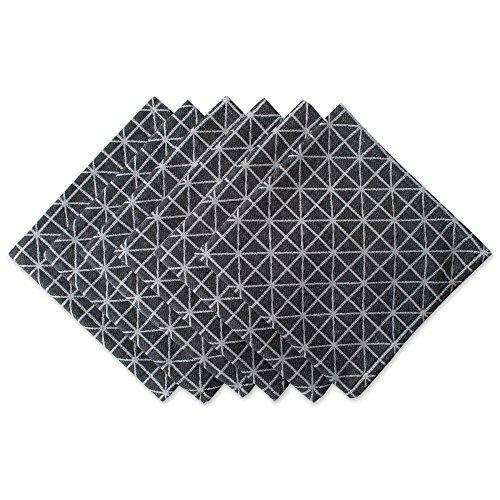 ADDS A FINISHING TOUCH - Crafted from cotton, our reusable cloth napkins with woven triangle design can be folded neatly on dining displays or dressed up with a napkin ring for a big impact. ENHANCE YOUR HOME - Add a bold accent color to our classic black and white geometric triangle pattern to add drama into any room. FOR MORE DÉCOR - DII offers delightful home products including cloth napkins, napkin rings, placemats and tablecloths. Click the DII link at the top of the page to explore our collections or search "DII Table Tops".